While this sale was not as massive and amazing as Nanette’s Archive sale a few months back, its worth a visit if you’re in need of something feminine and fresh! 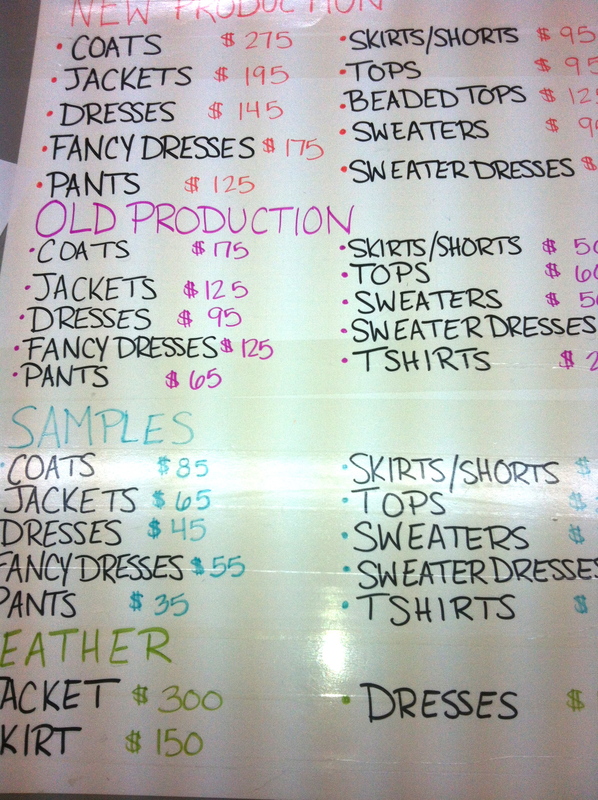 I snuck a picture of the price list when I was checking out – sorry for the quality! I walked out with this Runway Talent Show Dress. It was a $95 dress ($450 retail), I didn’t see any others. I had been crushing on this quintessential Nanette print for almost a year now and I just had to have it! Made in NYC, couldn’t go wrong!! I walked down 35th Street and passed several wholesale stores that were having $5 and $10 sample sales, I would have stopped in, but I was on a mission for Tory Burch. When I arrived at her sale, the line was stretched from 8th to 7th avenue. I decided to pass for the day, I already spent too much money!